There are other sewing tools that may not fit into such categories as needles, thread and pins; they are nevertheless sewing tools that any sewer should have in their sewing box. What kinds of other sewing tools are there that we should have? At the top of the list is a dress form for fitting patterns and garments during the construction process. There are dress forms in a variety of price ranges, but one should purchase what meets the immediate need and progress on to a better quality dress form with more features as the sewing skill level increases. Pattern weights are a very useful tool for holding down the edges of a project, when pins are difficult to use during cutting or measuring. One of the advantages of using pattern weights is that unlike pins, they do not tear pattern tissue paper. Some sewers use weights exclusively, and they come in all sorts of colors and materials, and even different shapes. If one does not have a cutting table with the heavy plastic cutting mat, then this cardboard pattern cutting surface is designed to be used anywhere pattern cutting is being done. 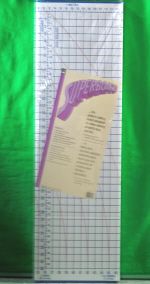 It is especially a good tool for pattern alterations, because pins can be stuck in the cardboard surface during alteration of the pattern. Interfacing is actually one of those very necessary other sewing tools for garment construction. Interfacing provides bulk and stiffness where it is needed on a garment, such as in collars and jacket and blouse facings and sometimes as a waist band facing. Interfacing is a must and should always be kept on hand, since there are very few patterns that do not call for some sort of interfacing. Interfacing comes in white, black and gray and should be kept on hand in all of these colors to go with different color fabrics, for example, you would not want to use a black interfacing with a white fabric, but would want to use a white interfacing, and a black interfacing definitely looks better with black fabrics. When it comes to color fabrics, a rule of thumb is dark interfacing with dark colors and white interfacing with light colors. Interfacing can be either fusible, meaning iron on or sew-in. Most patterns call for fusible interfacing. Adhesives in spray and glue form are very useful tools. Spray adhesives are good for hem preparations and for holding down appliqués during the construction of appliqué quilts, helping to hold the appliqué in place as it is stitched. 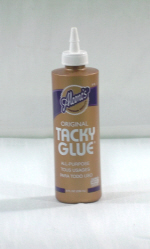 Glue adhesives are good for garment repairs, craft and home décor projects. Portable garment steamers are a nice tool for freshening up a completed garment to remove wrinkles or even for removing wrinkles during garment construction during fittings. These are necessary tools for turning tubes and pushing the points of garments into place, such as the points in collars. Scissors and other sharp objects are definitely not good for pushing out the points of collars, so bodkins; point and tube turners should always be kept in the sewing kit. Some sort of fray checking solution is also handy to have for those fabric edges that fray easily. This solution can stop a delicate fabric from unraveling before the edges are finished by serging or zigzag for example.